HomeNewsSurprise Yourself: Hit the Trail! Are you ready to shed winter and join the birds and flower buds in appreciation of early spring? Southfield City Centre now has more shared-use paths than ever before, just waiting for you to explore. Surrounded by a friendly urban ecosystem, you’ll find public art, natural beauty, historical landmarks, and a park made entirely of red poles that at night, magically twinkle blue. Upgrade alert: be aware that during the spring and summer, about two miles on either side of the Northwestern Highway service drive will be under construction. Along the southbound side, construction will take place from Civic Center Drive to 9 Mile Road. On the northbound side, the work will take place from Northwestern Highway to Lahser Road. This minor inconvenience is work that extends the trail, so be sure to come back in the fall when the work will be complete. 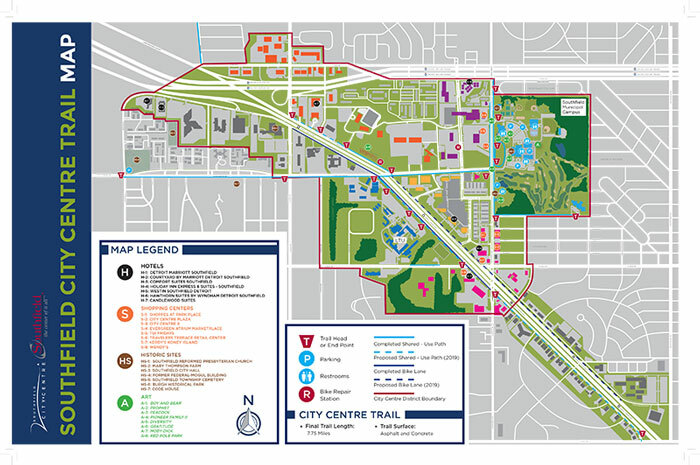 Bike, hike, walk, or run along the expanding Southfield City Centre Trail. Here is a brand-new trail map to help you find your way. Watch for updates to the map as the trail expands.